Janzen's is proud to offer the services of two Nurse Practitioners exclusively for our patients. Our Nurse Practitioners are able to manage a wide variety of medical issues; such as treating minor infections or managing high blood pressure. For more information on our Nurse Practitioners, please click here. Our Nurse Practitioners are also able to perform home visits for our patients who are unable to access our pharmacy locations. Our Nurse Practitioners will also see regular Janzen's pharmacy patients who visit our walk-in Travel Health and Vaccine Clinics for non-travel related medical issues. 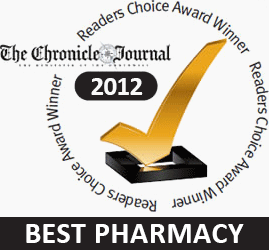 This service is limited to regular active patients of Janzen's who use our pharmacy on a continuous basis. Please contact our staff at our Bay Street location for an appointment (807-345-1191). Our Nurse Practitioners are able to follow your INR and adjust your warfarin dose through a collaborative partnership with our professional pharmacy staff. Our Nurse Practitioners are also able to perform home visits for our patients who are unable to access our pharmacy locations. Our Nurse Practitioners offer an injection program for patients who require regular methotrexate injections. We are available at our Bay and Algoma location from 1:30pm to 3:30pm every Tuesday for this service. We can also schedule appointments for this program if our patients are unable to access our Tuesday clinic. This service is limited to regular active patients of Janzen's who use our pharmacy on a continuous basis or to the public*. Our Nurse Practitioners perform MTO physical examinations five days a week by appointment. This service is available to the public*. Please contact our staff at our Bay Street location for an appointment (807 345 1191). As of Feb 14, 2017 our physical examination cost is $80+HST. Our Nurse Practitioners perform non-medically necessary Tuberculin Skin Testing (TB Skin Tests) for the public four days a week by walk in at our Travel Health and Vaccination clinics. Please click here for more information*.